The Loves of Jenn: Ultrasound pics and birthday wishes! Ultrasound pics and birthday wishes! Julianne wants to wish her Grammy a very happy birthday today!! My mom is great. She does a lot for me and I appreciate her so much. I only wish we lived closer so we could see her even more. She is a wonderful grammy to all three of her granddaughters and is super excited for grandchild #4 to arrive. When we told her I was expecting again, you would have thought it was her first grandchild. She loves nothing more than being a grammy. She comes to see us all the time and helps me out so much with Julianne while she is here. I know if I called her today and said I needed her, she would be here tomorrow and that is a great feeling. Thanks mom for all you do for my family. We all love you so much and hope you have a wonderful day and a great weekend out of town! What better present for my mom than pictures of the new baby? I went to my ultrasound today and got to see our little darling on screen for about 30 minutes. The baby did quite a bit of moving while we were there including a few somersaults, handstands, and rolls (can't wait to start feeling all that in a few weeks). The Dr. said the baby "looks great" and everything was measuring right on schedule (actually about 5 days ahead of schedule). 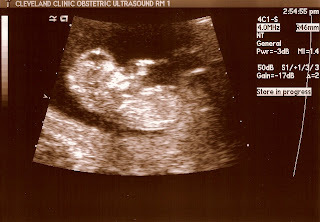 We will have our BIG ultrasound on September 23rd and we will find out what we are having (too early to tell today). 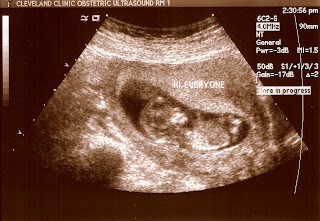 Here is picture #1 - as you can see our ultrasound tech wrote "Hi Everyone" for all of you! I felt pretty good today except for being extremely tired. I'm hoping to go to bed early tonight (right about now actually) and getting a full night's sleep (besides getting up 3 times to pee). Good night! Aww how sweet!! I hope your Mom has a great birthday. yay that your baby looks great! what an amazing little thing! Happy birthday to your Mom! That is the greatest birthday gift. It's so amazing to see an ultrasound. How wonderful! I'm obviously way behind in blog world, like usual. But my m-i-l told me you are pregnant! I'm SO excited for you! Congrats!